Notes on a Scandal was released in December, with obvious hopes for Oscar (and other year-end) plaudits. And with a cast like Judi Dench and Cate Blanchett, it’s hard to go wrong. But were the film released in September, it might have gotten a more appropriate, measured response. From the book Zoe Heller, Notes on a Scandal tells the tale of people behaving badly. First up is Sheba (Blanchett), a new teacher at a high school in a blue-collar section of London. She has been a stay-at-home mom for the last decade, caring for her teenaged daughter and her son with Down syndrome. As she explains to her new friend Barbara Covett (Dench), she just got exhausted and thought she’d give her life a new start. At some unspecified point — maybe when young Ted (Tom Georgeson) dedicates his schoolyard goal to her — she falls for a 15-year-old student of hers, and they begin a sexual affair. Perhaps this is the film’s weakest point. I’m never sure what motivates Sheba to start something with a kid less than half her age. Sure, she’s had a challenging, isolated home life, and sure, her husband (Bill Nighy) is quite a bit older, but her affair with the student is so clearly, obviously wrong that you almost have to take it on faith that she is capable of making such a mistake. Without it, there would be no story. Blanchett is fine in the role. She humanizes the character that is essentially a plot device. But the affair is only the beginning. We learn about it as Barbara spies on her from a distance at an after-school event. She’s spying because Barbara has an obsessive interest in Sheba. She imagines that her obsession will turn into a full-fledged relationship, if only she can stalk Sheba long enough. The evidence of the affair gives Barbara a strong power over Sheba that she can hold or play like a wild card. If Barbara can’t win Sheba, then she can at least blackmail her. And if that fails, she can destroy Sheba so that nobody can have her. Both of these situations are incredibly tense, which makes Notes on a Scandal a tough movie to watch. Nobody is the good guy in this film, except perhaps for Sheba’s husband and her Down-syndrome son. If you like a good edge-of-your-seat thriller but don’t like blood and gore, Notes on a Scandal is the perfect film. Another reason to see it is, of course, the wonderful performances from its two superstar actresses. Dame Judi Dench plays a more obsessive “friend” than The Cable Guy. Think of Kathy Bates in Misery, and you’re on the right track. Dench has the power and presence to really make her character frightening. Manipulative, cunning, yet also self-deluded, Barbara is a schoolmarm you don’t want to meet outside of class. And although Sheba’s fatal flaw is unsatisfyingly contrived, Blanchett rides the aftershocks well, balancing Sheba’s fear, need, and protective instincts. Notes on a Scandal is a very good movie, but it isn’t perfect. It doesn’t seem worthy of any best-of-the-year honors. 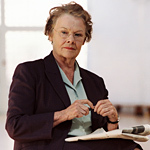 Then again, 2006 didn’t have many truly outstanding films, so maybe Dench’s performance really is among the best. In any case, Notes on a Scandal is good and tense with some very good performances, if nothing more.